We made the wedding ring curved, to fit between the two rings. This way, they can be worn all 3 together, or with either one of the engagement rings ‘puzzled up’ with the wedding ring. 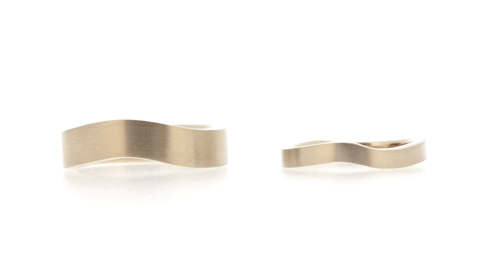 Following the shape of her wedding ring, we then made the Men’s version with the same shaped curve. Being a couple with rather unconventional taste, they chose to keep their rings in 18K White Gold, original colour, meaning that they are not plated to look white. A unique and more rugged look.